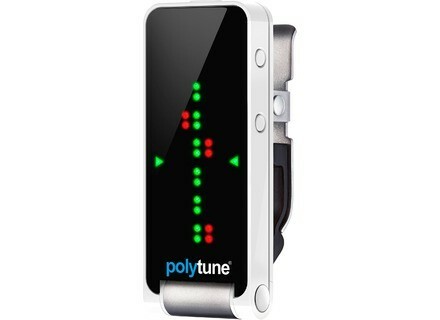 PolyTune Clip, Tuner/Pitch Pipe/Tuning Fork from TC Electronic in the Polytune series. You all know the PolyTune, right? The pedal that revolutionized the tuning world five years ago by providing a polyphonic mode that allows you to see the pitch of all strings at once? Well, after introducing a second and a Mini version, TC Electronic presents now a model that clips on to your instrument's headstock. That definitely sounds cool, but how well does it work? The PolyTune has nothing to prove anymore. The little white boxes have seized the pedalboards of guitar players around the world, thanks especially to their polyphonic mode. Just think about it: You need only one single movement to check the tuning of all the strings of your guitar between songs. Bye-bye to awkward and unnecessary pauses during gigs. The PolyTune series welcomes a new member to the family. 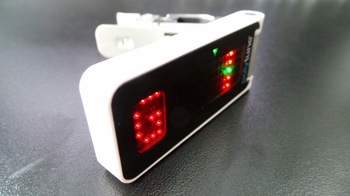 It is less expensive ($49.99), smaller and it clips on to your instrument's headstock. Hence, you can easily use it on your favorite acoustic guitar (for instance). Onstage you'll probably prefer the classic models, sitting tight on your pedalboard (or on the ground), since they are more robust and can be powered by a PSU. This will spare you from having to change batteries during songs...Because the PolyTune Clip ─ which is definitely more "casual" ─ can only be powered with a single coin battery (CR 2032), which is typical for a clip-on tuner. The PolyTune Clip is very lightweight and you won't even notice it when placed on the headstock of your instrument. Nevertheless, the manufacturer recommends that you don't leave it attached to your instrument all the time, because some finishes might be harmed if in constant contact with the PolyTune Clip. A nice gesture by TC Electronic is that, inside the box, they include a code to download free the PolyTune plug-in, so that you can use it with your favorite DAW. Sweet! It's important to note that the PolyTune Clip turns off automatically after three minutes, features bass and guitar modes and can go down as low as B and up to the 7th fret with a capo (the concert A can be adjusted from 435Hz to 445Hz). Additionally, the display reorients itself automatically so that you can always get a clean read, which is super convenient. Plus, the Clip also features the same qualities as the classic PolyTune: good precision, bass and guitar modes, needle and strobe modes...The only drawback is the lack of a Drop D mode. A pity. We would've also appreciated some labels on the tuner, because, even if it only has three buttons, sometimes you can't help groping a bit until you find the right one. And there is still no polyphonic Open Tuning mode, so you'll need to go string by string. TC Electronic has delivered a clip-on version of its famous PolyTune that will thrill acoustic instrument fans and those who don't want to bother switching on their pedalboards. It's light as a feather and really tiny, which doesn't stop it from having a large display. It obviously has the same qualities as its bigger siblings, namely the famous polyphonic mode, good precision, needle and strobe modes, and a variety of possible tunings. Our only criticism is the lack of any labeling on the tuner, which would make things easier in the beginning, as well as the lack of a Drop D mode (even though the original PolyTune does feature one) and an Open Tuning polyphonic mode. 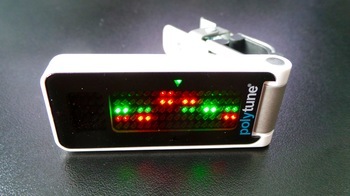 But, despite this, the PolyTune Clip remains a very effective, nice and compact tuner. Its $49.99 price tag is certainly justified, given its undeniable qualities.